Stacey Pullen’s Blackflag Recordings is anionic label that deals only in quality music. As such it is a huge step up for fast rising UK outfit MASON Collective to serve up their last EP on the mighty imprint. 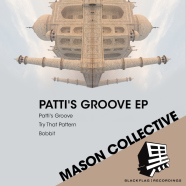 Patti’s Groove is up first and is a tightly programmed house track with kinetic drums. The clipped vocals bring real energy and driving bass hammers home the solid groove. Try That Pattern is another high tempo, no frills house tune with robust drums and spinning hi hats bringing the funk. Freaky synth sounds add intrigue and ensure maximum destruction. Last of all, Bobbit is another hi tech bit of house funk with popping sounds, rugged drums and knotted bass that demand you sweat. This is a high impact EP of slamming house.